Drop out rates in some cities hovers between 30-40%. Much of the focus of this achievement gap stems from issues around equity. As teachers we are responsible for the wellness of the Whole Child, this includes their Social Emotional Learning (SEL), and wellness. School counselors are overwhelmed with the responsibility to address these issues on their own, as teachers we need to support the effort with our instruction in the classroom. Simple SEL tools can be incorporated into instruction to support this learning and growth. Inspired by this goal, this site provides insights and tools that will greatly assist teachers committed to growth in this area. The action research conducted reveals how SEL-informed tools like Flipped Lesson plans can help support our students. Flipped learning supports cognition by providing more chances for research, self-study, interaction and collaboration (Ahmed, 2016); this also supports the key 21st learning goals of creativity, collaboration, critical-thinking, and communication. Flipped learning is just one of the tools suggested on this site. 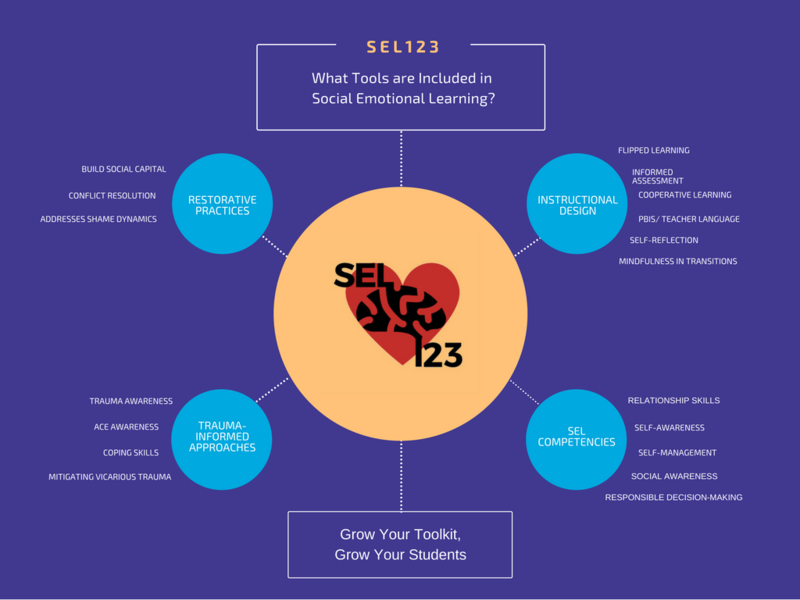 In addition to tools, an assessment survey is provided that allows teachers to assess their SEL competence, with suggestions for growth emailed to their inform their professional development, and effect on students. How-tos: Discover new ideas on implementing SEL in the classroom, including when it's effective, and how to track progress. Lessons:​ Look here for example lessons using tools that support SEL. Included is a Flipped Lesson to help acquaint you with trauma-awareness and ACE implications. Assessment: This special tool designed for teachers, allows you to assess your use of SEL tools, and provides suggestions based on your responses. Take the survey later in the school year to track your growth. Reference: Find links to websites, blogs, videos, and research that supports SEL in the classroom. Throughout this process I've discovered many tools to convey my project vision. Specifically, drawing on insights from Baggio, visual engagement helps create strong impressions. Visual tools were used extensively to create videos, images, logos, and infographics. Canva: Great free tool online, providing the novice graphic artists with tools to create logos, infographics, and other graphic organizers. iMovie: Application that empowers users to create videos with images, clips, audio, and music. Combined with a voiceover, this tool allows for the creation of professional grade videos. Google Forms with Add-on's: Surveys, and assessments are easily created with Google Forms, followed by the clever application of Add-on's. These Add-on's can perform a number of function, from auto-grading, auto-emailing, data compilation, and more!